One of the features of the first two games is the fact that Unai Emery has been brave with his team selections. I think picking an extremely inexperienced 19 year old midfielder against Man City could certainly be put into that bracket, although as with any decision like that it skirts along the line of foolish too. Thankfully, Matteo Guendouzi more or less repaid his faith. Errors in the first game were not present in the second, and while it’s still very, very early days for him, there are promising signs. I’ve written about the Spaniard’s substitutions, taking players off when he feels they’re not playing well enough, and again it’s too early to know if this is a feature of his management style or down to other factors like injury, disciplinary worries, or simply him finding his feet with this group of players. He has the scope to make changes up front and in midfield, but at the back he’s a little more restricted. I’ve seen plenty suggest that Stephan Lichtsteiner could come in for Hector Bellerin at the weekend, and if he makes that decision then fair enough. He contributed well in the attacking third at Chelsea, but could have done better defensively a few times, and there’s an experienced player there to provide competition so why not use him? Where I think he’s a little stuck is at centre-half. He obviously sees Shkodran Mustafi and Sokratis Papastathopoulos as his first choice, and while the pair have had issues in our first two games, I suspect he’ll feel that playing City and then Chelsea isn’t really enough time for them to bed in together and form any kind of partnership. If you’ve listened to the Arsecast Extra this week, you’ll know I have serious reservations about the German and his concentration, but the fact that the only alternatives to him are Rob Holding and Konstantinos Mavropanos mean he’s likely to stick with what he’s got for the next few games at least. Mustafi, based on the stats from the Chelsea games, is a key part of building from the back – involved in our top 3 passing combinations on the day (Cech > Mustafi : Guendouzi > Mustafi : Mustafi > Bellerin). On the ball he is a decent passer, he’s pretty calm under pressure, and that part of his game is useful to the way that Emery wants to play. What we have with Mustafi though is two years of his performances on which to judge him as a defender, and it’s hard not to have some concerns based on that. 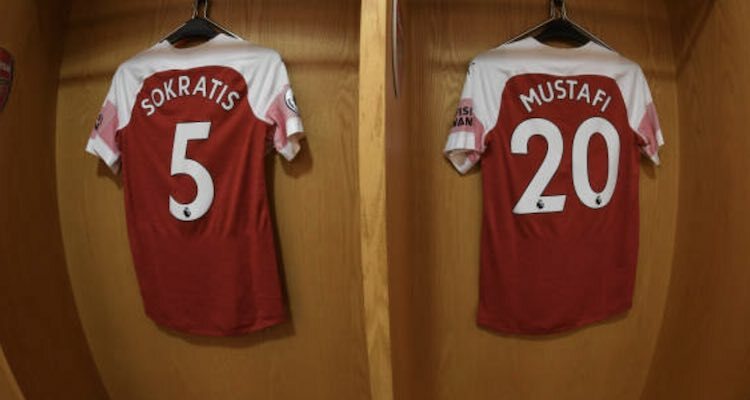 We don’t have that with Sokratis yet, but stylistically I worry a bit that they’re a bit similar. Aggressive, front-foot defenders who want to win the ball in the first challenge, and it puts me in mind a bit of Laurent Koscielny and Thomas Vermaelen whose characteristics made them basically incompatible. When the Frenchman was paired with Per Mertesacker, someone whose reading of the game and positioning complemented his dynamic defending, we had a partnership that actually worked. And perhaps nowhere else on the pitch is this partnership as important as centre-half. You could, in the past, point to the midfield two as equally important, but the game has changed in that sense and the iconic duos that used to be a feature of teams are not really the way it works anymore. It’s still true at the back though, especially when you play a back four, and my suspicion is that over the coming weeks when the games are a bit less challenging than our opening two fixtures, Emery will attempt to make this particular partnership work. I wrote the other day about how we’d know a bit more about the new manager at the end of this run of eight Premier League games, and we’ll definitely be able to tell if Sokstafi is a viable thing at that point too. The question of what to do if it’s not is an interesting one, because underneath them we’ve got Holding, a player of some promise but one who still has much to learn, and a 20 year old about whom we can tell very little based on three games last season. He was sent off in one, and the other two came at the end of the campaign when there was no pressure to produce in the Premier League anymore, we knew Arsene Wenger was going and whatever happened we weren’t going to finish any higher or lower than sixth. He could be a great find, ready to take his chance when it’s given to him, and I very much hope that’s the case. But more than likely he’s a young defender with limited experience who will, as most young defenders do, learn on the job which almost always comes at the expense of defensive solidity. People have been encouraged by the work of our recruitment team this summer, doing deals quickly and efficiently so we avoided the end of window scramble that has for too long been a feature of our transfer business. Yet if their remit is to give the manager the tools/players to succeed, it’s hard not to worry they’ve left him a bit short of quality and depth in a key position. Glass half-full: Mustafi and Sokratis click, we remain somewhat vulnerable but better with more midfield protection, and the attacking side of our game makes up for defensive weakness. The young defenders do well in the Europa League/Carabao Cup and keep the senior men on their toes. Glass half-empty: Inherent flaws in our defenders give us an unstable platform on which to build our game, thus hindering the ability to control and attack. The young defenders lose confidence as they’re exposed too often. Which glass are you this morning? I prefer the former, I fear the latter, but time will tell as we go into this run of winnable games (on paper at least). Right, that’s just about that from me. I’ll be back tomorrow with an Arsecast in which I chat with former Gunner Alan Smith – and if you’re around tonight, he’s launching his new book at The Tollington from 5.30pm. Get on down, grabbed a copy, get it signed, and have a sneaky Thursday evening pint.